Crochet sun hats make it fun to continue crocheting when its warm! Here is a free pattern to take on a Saturday morning fishing with daddy, complete with a goldfish applique. Here’s another sun hat for the little prince in your life. 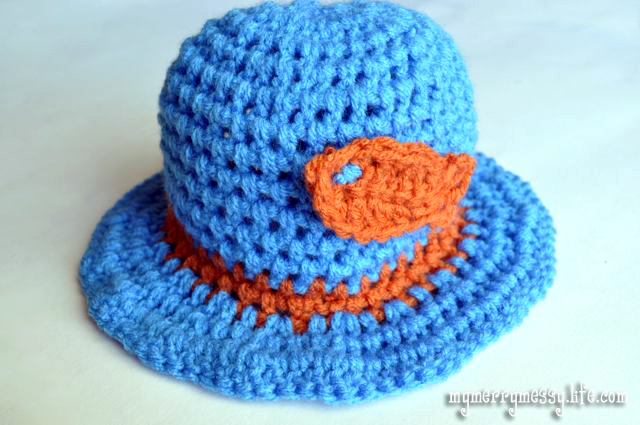 See the patterns for a toddler boy sun hat here. 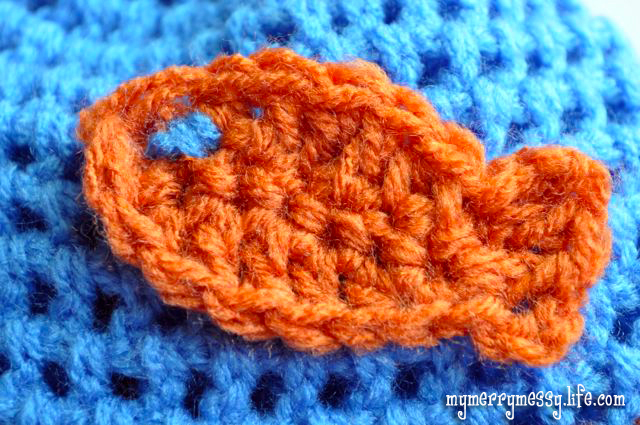 Click here for the pattern for the goldfish, which is pretty easy to make. This pattern will fit a baby about 6 to 12 months, or with a 16 to 18 inch head (see my list of crochet head and hat measurements and how to calculate them). To make the hat larger, add more increasing rounds to the crown. To make it smaller, take away an increasing round. I have marked the increasing rounds below. CH 1 counts as first DC unless otherwise indicated. Most use a CH 2 with a double crochet, but I like CH 1 because it creates a neater join for each round. Round 1: CH 1. Work 10 DC in ring (11 DC total). Join to beginning CH 1 with a SL ST. Round 2: CH 1. Work a DC in the same stitch. Then work 2 DC in each DC space around (24 DC total). Join to beginning CH 1 with a SL ST. Round 3: CH 1. Work a DC in the next stitch. Work 1 DC in each stitch around. Join to beginning CH 1 with a SL ST. Round 4: CH 1. Work a DC in the same stitch. Then, work 1 DC in the next space. *Work 2 DC in the next space. Work 1 DC in the next space. * Repeat from * all the way around. Join to beginning CH 1 with a SL ST. (36 DC total). Rounds 5-13: Work 1 DC in each space around, joining each round with a SL ST and CH 1. I changed colors at row 12 and 13 to Pumpkin. Click here for cute goldfish pattern!